The marks on the edges of this pillar stone (left) are characters from an alphabet that was used in fifth-century Ireland. Known as ogham, the 25-letter alphabet was supposedly inspired by Ogma, god of eloquence. Ogham was carved and read from BOTTOM to TOP. (Also carved, occasionally, right to left). Also written as ogam or ogum, it is pronounced "AHG-m" or "OH-ehm." Ogham served as an alphabet for one of the ancient Celtic languages. Its origin is uncertain: it may have been adapted from a sign language. Current understanding is that the names of the main twenty letters are also the names of 20 trees sacred to the druids. Some authors have suggested the existance of a 13 month calendar which shared some of these names. A 15th century treatise on Ogham, The Book of Ballymote, confirms that ogham was a secret, ritualistic language. Shown at right is a key to ogham: its consonants and vowels can be identified by the number, position, and direction of their notches. The letters consist of one to five perpendicular or angled strokes, meeting or crossing a center line. The form of the letters allows them to be carved easily on objects of wood or stone, with the edge of the object forming the center line. This is a standing stone (galla'n) on Dingle Peninsula, Ireland. Any wood carvings have of course long vanished: the Cetlic runes are known principally from incriptions cut on the edges of rough standing gravesones. These are found primarily in west Ireland, but they have also been found in Wales, Cornwall, western Scotland, the Isle of Man, and the Shetland Islands. The Irish had no other written alphabet until Christian missionaries introduced Latin (though runes may have also been used). ...or as lines crossing the middle divider, like this. This inscription says "beth luis nion";* this is a name of the ogham alphabet and, somewhat like the word "alphabet", comes from the names of the first, second, and fifth letters (remember: read from the bottom up). * NOTE: "BETH" is also spelled (perhaps more accurately) "BEITH." 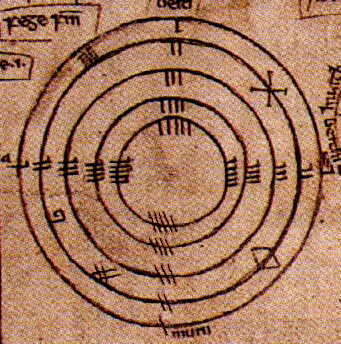 The following image of a Ogham wheel is a segment from the 14th-century Book of Ballymote , a manuscript that contains a collection of Irish sagas, law texts, and genealogies, as well as a guide to the ogham alphabet. 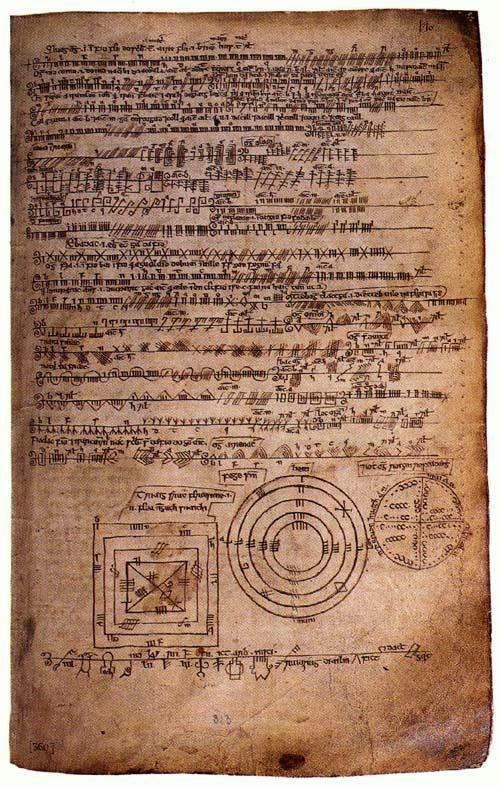 Much of the information available on ogham has come from this manuscript (currently housed in the Royal Irish Academy in Dublin) and this information is thought to have been copied from a much earlier 9th century manuscript. It is from this text that the descriptions of Ogham characters have largely been drawn. CLICK ON THE IMAGE TO VIEW THE ENTIRE PAGE. Please contact me if you wish to use elements of this page. Last Major Update: 05/07/99; Minor Updates: 2001, 2002, 2004, 2005 This page has recieved a Doras award. Visit the Doras Celtic internet directory.